Main Phase: Remove two +1 power counters from this card to put two 1 power Yellow Critter Friend tokens into play. 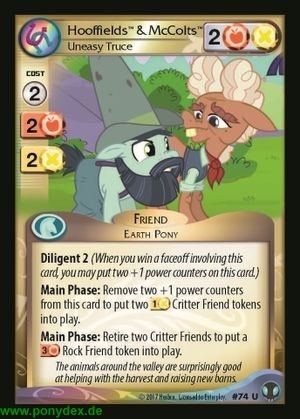 Main Phase: Retire two Critter Friends to put a 3 power Orange Rock Friend token into play. The animals around the valley are surprisingly good at helping with the harvest and raising new barns.